Lately we have been astonished at the quality of some of the budget acoustic guitars coming through from the likes of Ibanez, Fender and Hudson; these cost around £99 and look to have a good spec – solid spruce tops and decent necks and tuners – which should be good for the beginner or those on a tight budget. The accepted wisdom is that the more you pay the more you get but with today’s manufacturing processes, access to decent components and Far East costs, you can get some good guitars for little money. Not like when I was a teenager when the budget guitars were terrible – poor action and intonation and a ‘thin’ sound. You either gave up because it was so hard to play or you quickly bought a better guitar! When you first start, parents, naturally, don’t want to spend a lot on a first guitar for you just in case it is a passing phase! I have played a couple of these budget guitars from the major brands and they aren’t too bad! I am not sure though about some of the unknown Chinese made brands you see in some retailers – blue and pink guitars for £50-90. These look to have poor finishing, cheap feeling components and probably a nasty sound. So how do the major brands do it? Are these loss leaders to hook players in? Or can you genuinely make a reasonable guitar for £15-20? (the cost to manufacture something is generally one sixth of the retail price). It’s a little different with electric guitars as the components – pickups, electric and hardware – have a greater impact on the sound. Changing the strings and setting it up right may make a big difference and turn a budget guitar into something half-decent…or will it? 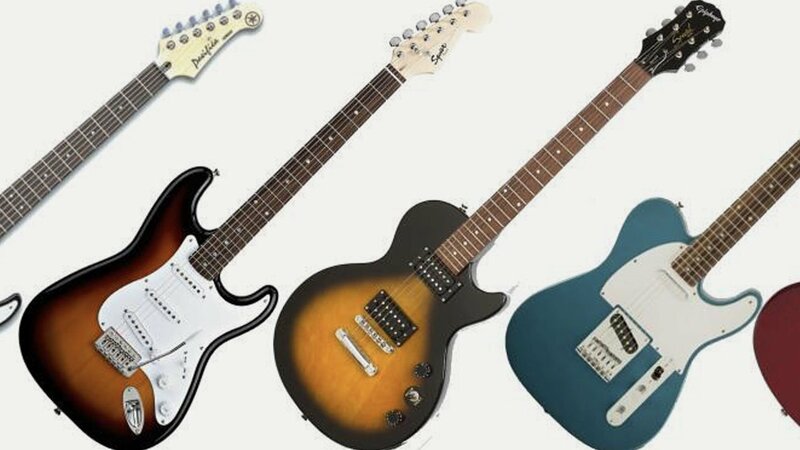 Again the major brands do produce some reasonable electrics for just over a £100 – Squier and Yamaha comes to mind – and bargains can be had. But again there are some unknown budget brands that just look, – and will sound and feel – terrible. But here’s the rub; as a beginner would you know? And as a beginner if you can play well on one of these then you can play anything…..
To choose a budget or starter guitar try and find one from one of the well known manufacturers; for less than £100 you can have an electric from, for example Fender/Squier, EXP, Westfield, Stagg and Deacon and if you go up to £150 you can add Epiphone, Yamaha, Ibanez and Washburn to that list. Acoustic guitars from Epiphone and Fender/Squier start from under a £100. You might also want to look at the ‘starter packs’ for beginners which will include everything you need to get you going – for an electric this will include a practice amp, lead, tuner and plectrums. These can be had from Epiphone, Fender/Squire, Epiphone, Hudson, Encore and Westfield. The choice of acoustic guitars under £100 and under £150 is vast with all the major manufacturers producing models in this range.